This week’s lecture will be a summary of the course with an emphasis on key tensions and opportunities for synthesis. We will begin our final class exactly where we began our first – with a discussion of Kafka’s short parable ‘Before the Law’. This time, rather than seeking to interpret the meaning of the text, we will consider its value as an invitation to pose questions of and about law & society. Butler, Judith. 2004. Precarious Life. The Power of Mourning and Violence. New York: Verso. Ericson, Richard. 2007. Crime in an Insecure World. Malden: Polity Press. Larsen, Mike and Piché, Justin. 2009. “Exceptional State, Pragmatic Bureaucracy, and Indefinite Detention: The Case of the Kingston Immigration Holding Centre.” in Canadian Journal of Law and Society. 24(2) 203-229.
and Larsen, Mike. 2013. “Indefinitely Pending: Security Certificates and Permanent Temporariness”, from the forthcoming edited volume Liberating Temporariness. I have prepared a two-sided 11×17 poster for this class. 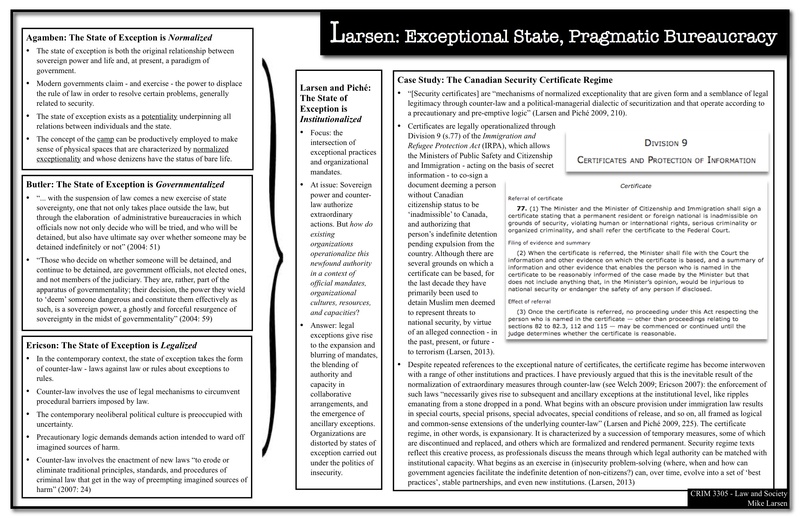 The first side provides an overview of some key points and quotes from Agamben, Butler, Ericson, and myself and Piché, as well as a short description of the Canadian security certificate regime. The second side is a reproduction of an April 2012 article I wrote for Prism Magazine. As always, students in CRIM 3305 – Law & Society can pick up a printed version in class. Agamben’s writings on law, politics, and power can be difficult to grasp the first time around, for a variety of reasons – not least because understanding Agamben requires an appreciation of the works that he is responding to (Schmitt, Benjamin, and Foucault in particular). In my experience, most people find it easier to engage with Agamben’s ideas by exploring the ways that they have been interpreted and applied by other theorists (Butler, Ericson, Giroux, and Welch, for example). 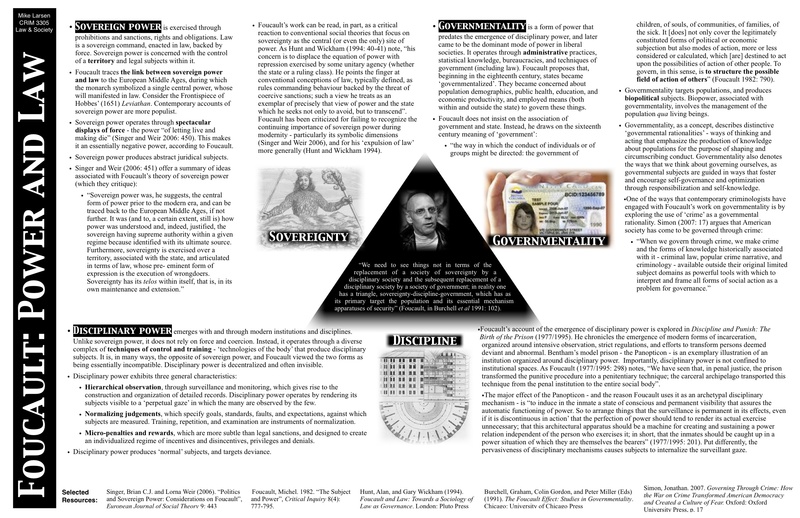 I have prepared a poster that offers an introduction to some of the key ideas explored by Agamben in Homo Sacer (1998) and State of Exception (2005). 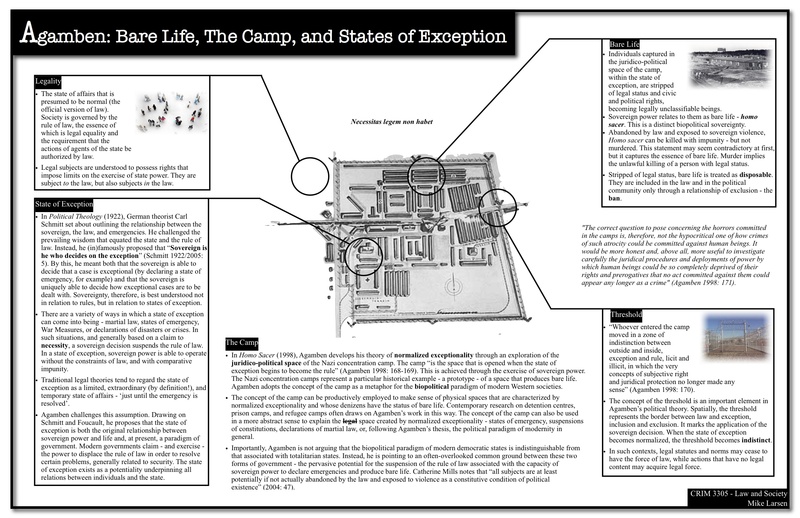 You can download a PDF version of the poster here: CRIM 3305_Agamben. Students in CRIM 3305 Law & Society can pick up an 11 x 17 copy in class this week. Note that the poster does not include some important preliminary concepts – specifically, Foucault’s account of power and the relationship between power and knowledge. Students in CRIM 3305 – Law & Society can pick up a printed copy in class. Douglas Hay’s 1975 essay “Property, Authority and the Criminal Law” offers an excellent account of law as an ideological system, based on an analysis of the 18th Century English Bloody Code. The essay was originally published in the edited volume Albion’s Fatal Tree, with an excerpt re-printed in Austin Sarat’s The Social Organization of Law. Below is a one-page jpeg outlining some of Hay’s main points. 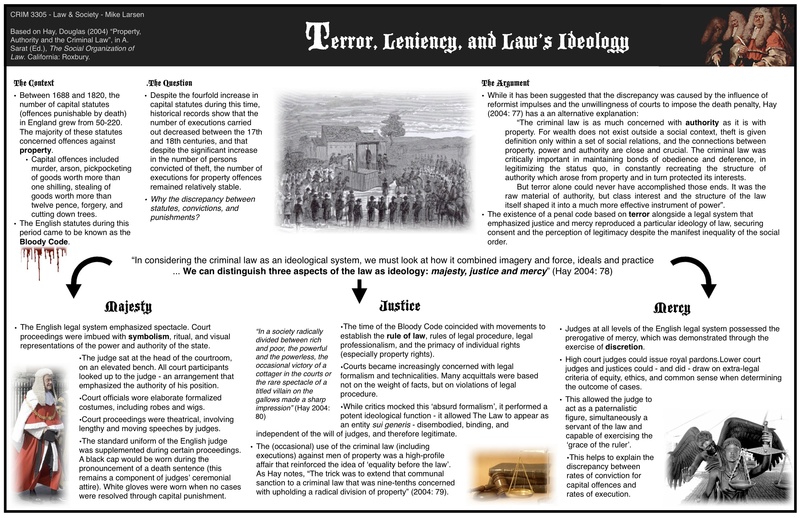 CRIM 3305 Law & Society students can pick up an 11×17 copy of this poster in class.